OPPOSITION Socialist Party 2021 presidential candidate, Dr Fred M’membe says the nation for once needs civility, humility and selflessness. And Dr M’membe who is Socialist Party deputy General Secretary said none of the Bishops or individual three church mother bodies involved in the National Dialogue and Reconciliation initiative was seeking political power. In seeking civility, Dr M’membe urged all political players to set aside the fears of losing power, mirroring dialogue to regime change, having preconceptions, or setting the dialogue process as a means to electoral win or loss. In a statement issued on behalf of the Politburo of Socialist Party – Zambia yesterday, Dr M’membe said a national dialogue devoid of shadow boxing should provide for genuine substantive conversations in the interest of national good. “And we believe a national dialogue process, devoid of shadow boxing and other ulterior motives, should provide for substantive conversation around the major grievances of all key interest groups as well as the national good,” he said. “The nation for once needs civility, humility and selflessness. Let us all set aside the fears of losing power, mirroring dialogue to regime change, having preconceptions, or setting it as a means to electoral win or loss”. He said from the moment the Socialist Party received an invitation to attend the preliminary meeting of the stakeholders to the national dialogue they did not hesitate to embrace both the need for the talks and the spirit of the letter from the conveners – the Church. Dr M’membe said the SP believed that national dialogue deserved their attention as a tool with the potential to facilitate peaceful political transformation while recognising that it was not a magic wand in itself. “Clearly, even those who defend the status quo – which for a moment benefits them – do appreciate the need to attend to a number of conflict-fuelling themes of political rights, basic freedoms, institutional reforms, election procedures, above all the need to have a Constitution that befits a multiparty democratic dispensation,” he said. “The world over, where need be – dialogue has been used to hear voices and possibilities. Why? It’s because it can encompass tensions and paradoxes – the only way to reach decisions that are acceptable to everybody. And Zambia today needs these means to avoid, or resolve, conflict”. Dr M’membe said what separated democracy from other political philosophies was the principle and practice of solving differences first and foremost through dialogue and wondered why there were derailments or attempt to put bottlenecks to the process that sought to cleanse the nation of its vices and weaknesses. He said the status quo could not be endured anymore and urged for transformation of the current conflictive political and social environment, relationships and enhance governance. “We are alive to the fact this dialogue cannot hold unless there’s a safe space in which the actors can interact with trust and respect. What the nation desires is a dialogue that consolidates the participation of social, economic, political, cultural, and institutional actors,” he said. “One that strengthens the values of democracy and fosters actions that are more inclusive and sustainable”. And Dr M’embe said, for any meaningful progress to be made, the convenors should be respected by the majority of citizens and should not have any political aspirations or goals that would present an obvious conflict of interest. “And the Church has the long-standing moral authority and broad constituent bases to lead this long overdue process in our country,” he said. “None of the Bishops or individual three church mother bodies is seeking political power”. Dr M’membe said the church had nothing to gain politically out of the dialogue process, save for the preservation of peace, societal stability, and safeguarding the path to sustainable development. He said the country could not wait until the obtaining violent political winds degenerate and envelop the entire fabric of society for all political actors to see sense to put off all the red lights flashing at the moment. “Accept that in a multiparty democratic dispensation change of government through elections is unavoidable – it is the essence of plural, multiparty politics,” he said. “Just as there will be generational change of leaders, governments will fall, be voted out. At times a ruling party will have an internal leadership contest which ushers in new leadership”. 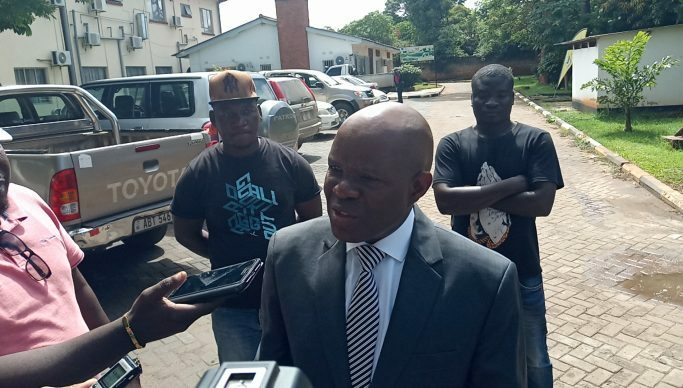 Dr M’membe said the abuse of the Public Order Act, the police, the courts, electoral process and the current Constitution that was full of lacunas – were all but premised on the principle or desire to perpetuate the PF’s hold on power but warned this would not work. “Rise from your comfort zone, come to the dialogue table. Let us get away from pettiness. We have a country to lead, a people to serve. The choking poverty is not simple statistics; these are our fellow citizens enduring the direct effects of poor and indifferent leadership,” he said.